The long-awaited and widely advertised Boyz Remukute finally dropped on Monday,l which also happened to be Heroes’ Day. This is a concoction of familiar names and relatively unknown names. The cast comprises of Sinbad90, Baller, Noble Stylz, Sharky, Millz, Covill James and Mcpotar. Several record labels are represented here; DollaSign Music, Studio Felonies, MasofaPanze, BigShots, iKoNiK Muzik Group and Family Bizness. 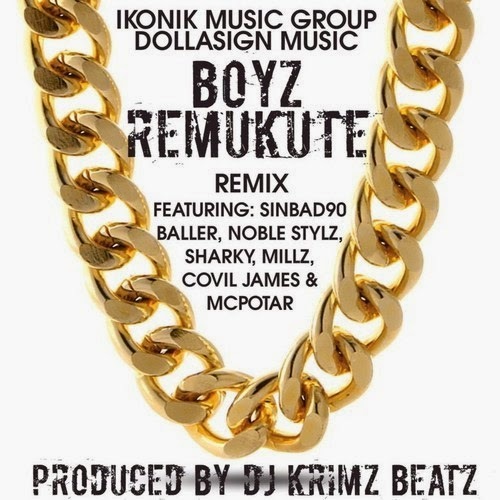 The long-awaited and widely advertised Boyz Remukute REMIX finally dropped on Monday, which also happened to be Heroes’ Day. This is a concoction of familiar names and relatively unknown names. The cast comprises of Sinbad90, Baller, Noble Stylz, Sharky, Millz, Covill James and Mcpotar. Several record labels are represented here; DollaSign Music, Studio Felonies, Masofa Panze, BigShots, iKoNiK Muzik Group and Family Bizness. This comes off as a follow-up single to Noble Stylz’s MaBorn Free, Sharky’s Better Than Most and The Mcpotar EP. Expectations run high with such a cast, may the verdict commence. The first thing I loved about this remix is that they made an effort to change the instrumental to differentiate it from the original , whereas most have resorted to making remixes that are more of alternative versions of the original. Not sure about all that shouting ala DJ Khaled though. In enters Sinbad90 with a verse similar to one from the original version, hold up, IT IS THE EXACT SAME VERSE! *insert frowning smiley here*. I don’t know if this was a case of overconfidence or what but to me this was like wearing the exact same outfit to church because it worked the first time. Fast forward….. In comes Baller with some refreshingly new lyrics to kickstart the remix, after Sinbad’s trip down memory lane, in case ‘makanganwa’. Under the umbrella of DollaSign Music and Studio Felonies this is one kid to watch out for #Sp3kkSaidSo. If the voice sounds familiar that’s because it is. The third verse from the chart-topping Tipei Maoko off the BigShots’ compilation Summer’s Ours was Baller. The baton is passed to the self-proclaimed Best Vernac MC Mr. MasofaPanze Noble Stylz who has been reaping the fruits of success since his debut album Masofa Panze dropped in the fourth quarter of 2013. Never being one to disappoint he turns the heat up in only a way he can do. In my mind I’m making the comparison that occurred on Kanye West’s So Appalled where Jay-Z made the verses after his sound unnecessary. Was this going to be the case here? Next comes the controversial rapper of the moment Sharky as he continues to explain why "he is better than most" and also his migration from the Chitungwiza residential area to the midst of the capital, that is Harare, in search of the proverbial mukute. Receiving the baton is the IkoNiK Music signees Millz and Covill James who seemed out of their comfort zones on this, probably due to the intimidation of having so much firepower on the same track. They have to be commended for their effort as most would have chicked out. Covill's verse comes to an abrupt ending that is hard not to notice. "Wakanganwa tisu boyz regoridhe" Mcpotar starts as he steals the show to deliver one of my favourite verses off this track. Go Potar go!!!! Sinbad's unnecessary bars are added on after Potar's verse, which should have concluded the track, making the 8mins longer than they really needed to be. Of all the posse cut remixes I've heard out from Zim Hip-Hop this happens to be the most cohesive of them all. DJ Krimz Beatz' album "The iKon" coming soon.